We all have had that phase in our lives when we used to imagine ourselves as the caretakers of a kingdom, given the responsibility to protect and design the kingdom using our special magical powers. In Christian households especially, it has been a rite of passage where fathers task their young children with designing a kingdom with magical powers. It is just another passage of rite like cleaning the washrooms or washing the car once you are capable of putting that cleaning force. Citadel Arcanes takes up a boring puzzle game idea, where you are tasked with building a Citadel by becoming the Grand Architect and makes it an engrossing quest. You get so engaged in the game that you even forget that you are responsible for the fate of an entire kingdom. The reason why Citadel Arcanes is so interesting to play is that it combines two different genres of gaming- simulation and match-3 puzzles. In the game you take up the character of the Duke's daughter where you have to collect resources like gold and food in order to achieve objectives like planting trees or constructing buildings like chapels and hospitals. 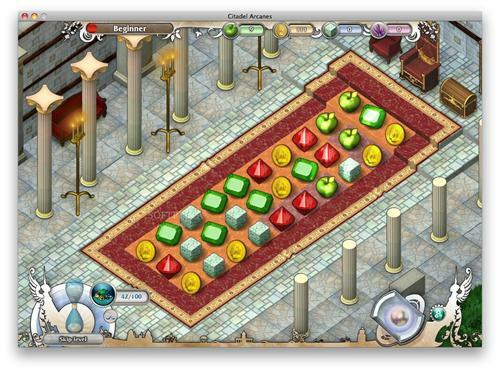 And to obtain these resources you need to play the match-3 puzzles. There are 2 parts in game play. First is the Sim City like kingdom building game where you have to pick up the required objects from the catalogues to build you kingdom and place it at the right position on the grid. The bottom menu bar is the same easy to scroll bar of Farmville. As you solve more puzzles, more objects unlock in the catalogue. The controls are somewhat inefficient. It is very difficult to remove a small object using the eraser. A zoom in option would have been handy in here. Once you have done fixing the objects on the grid thereby completing the fixture which was your aim; you revert back to the puzzle solving part. 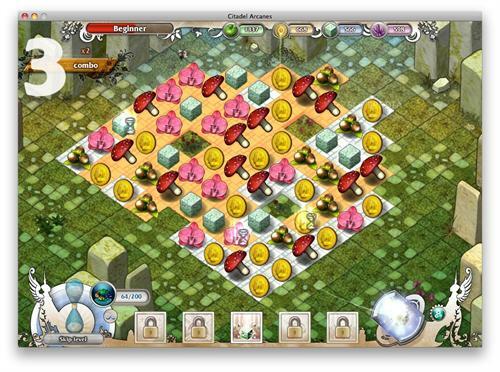 In the puzzle mode of Citadel Arcanes, you are given several icons (gold bars, rubies, flowers, what-have-you) and must align them on the grid, three in a line to clear them off. You do not have empty spaces and you move the icons by switching with the adjacent icon. Just like in Tetris, when you clear a grid the top ones will fall in to fill that place. Use your mind juice to clear more than 3 icons or create chain reactions so that one grid clears the falling icons clear off one more grids. Clearing more than 3 icons are counted as combos and these combos earn you more resources to use in your Citadel. It is quite easy to get a combo or do a chain reaction. It is quite easy to get these combos or do the chain reactions which reduce the difficulty level of the game. The alternative between the two layers of the game but still the feel is of one single game. The puzzle side adds a nice meaty side to the main game of match-3 puzzles. This game would have passed nicely as a social network game where we could have visited our friends Citadel for resources. Overall, Citedal Arcanes is an amazing game with its nicely structured two genre gaming. It is ot easy to get with this type of gaming, and to keep you going there are over 50 levels in Citadel Arcanes and loads on items to unlock. 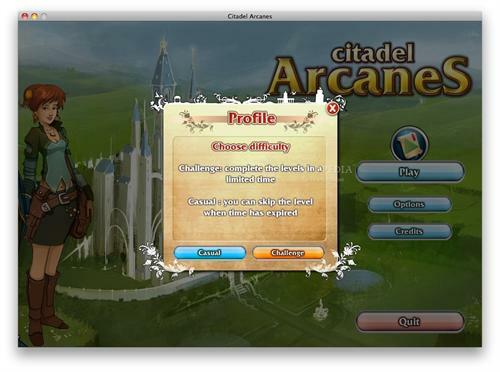 Even if the theme is lame (of magical Citadel building), the game play is very far away from being labeled lame.